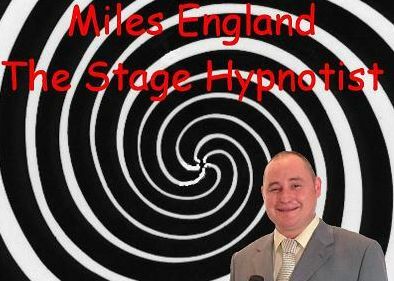 Miles the comedy stage hypnotist is a top hypnotic entertainer and hypnotism extraordinaire is based in the north of England however will travel all over the United Kingdom with his non-stop laughter hypnosis show. The show is suitable for almost anywhere as long as there is at least 40 people in the audience. Whether its corporate entertainment, a Christmas, Birthday party or Wedding party then call the free phone number now to book one of the most unique stage hypnotists in the UK. Miles is also available for holiday camps, European holiday resorts (fly backs only), pubs, clubs and theatres at the keenest of prices. The hypnosis show can be modified to suit a family audience or a adult audience depending on your requirements. In both shows you will see crazy sketches such as a man having a baby, the crazy frog, top fashion models and the Japanese comedian as well as many, many more. Miles has over 100 sketches he can perform ranging from a selection of "Rude but not Crude" sketches to a family friendly show. Miles prefers an audience size of over 50 people as this ensures a good selection of people to choose from during the hypnotism show. No one is ever forced to take part in the show and Miles the hypnotist always respects his volunteers at all times. No one even in an adult show will never be asked to remove any articles of clothing or made to eat onions, to be fair as a professional he does not need to resort to such tactics. Miles England is a FULLY INSURED hypnotist and all his stage hypnotist shows conform to the 1952 hypnotism act and the 1994 review.